As anyone who frequents this blog knows, I spend a lot of time talking about logical fallacies. I frequently criticize peoples’ arguments for having them, and I present them as a reason for rejecting particular lines of thought. Nevertheless, many people fail to realize just how important they are, and showing someone that they have committed a fallacy rarely makes them reject their argument. Indeed, I once had someone say, “just because my argument technically contains a fallacy doesn’t mean that the underlying logic is wrong.” In reality, however, that is exactly what it means. Logical fallacies are, by definition, flawed lines of reasoning, and anytime that an argument contains a fallacy, that argument must be rejected. Therefore, understanding logical fallacies is critical for analyzing arguments and holding rational views, and in this post, I want to try to explain why fallacies are so important, how to detect them, and why their presence destroys an argument. All arguments can be broken down into premises and conclusions. The premises are the facts that you are presenting, the conclusion is the thing that you are arguing for, and the goal is to set up the argument such that the conclusion must follow necessarily from the premises. In other words, for an argument to be a good argument, it must be set up such that if the premises are true, then the conclusion must also be true (this is what we call a “valid argument”). Additionally, the premises must, of course, actually be true (when both conditions are met, the argument is said to be “sound”). For now, I want to focus on the requirement that the conclusion must follow necessarily from the premises, but we will come back to the true premise requirement later. Note: I am talking specifically about deductive arguments here and throughout this post. There are other types (such as inductive and probabilistic) in which the premises show that the conclusion is most likely true, rather than that it must be true. To illustrate how this works, let me use the following example (this is set up in what is known as a syllogism). I could keep going, but hopefully you get the point. It doesn’t matter what premises I use, or how disparate the items in them are. As long as the premises are true and I retain the same logical structure, then the conclusion must be true. Further, if you can find a single example in which this structure and true premises results in a demonstrably false conclusion, then you have shown that the argument’s structure must be flawed. In other words, for a deductive argument, the logical structure must work 100% of the time, or else the logical structure is flawed. It may seem like I am off topic here, but understanding this is really important, because, as I will explain below, many logical fallacies operate by breaking an argument’s logical structure. In other words, they change the argument so that the conclusion does not follow necessarily from the premises. Now that you understand the importance of a logical structure, let’s look at a large family of fallacies collectively known as non-sequitur fallacies. These occur anytime that an argument’s structure is such that the conclusion does not follow necessarily from the premises, but there are many specific subcategories and types of fallacies within that overarching umbrella term. That may seem confusing, but if you think about it for a second, you should be able to convince yourself that it will work 100% of the time. If all X are Y, and Z is X, then Z must also be Y. Again, if you think about that for a minute, you should see the problem. The fact that all X are Y does not mean that all Y are X. Thus, it is possible for Z to be Y, but not X. We can easily illustrate this with an example. Obviously, that doesn’t work. It is clearly a bad argument. It has an invalid logical structure in which the conclusion does not follow necessarily from the premises, and, as a result, it produces an incorrect conclusion. Remember, if a deductive logical structure is valid, then it must produce true conclusions 100% the time (when supplied with true premises). Therefore, the fact that my example has an incorrect conclusion proves that this structure is invalid. Now, what does this have to do with affirming the consequent fallacies? Well that name, “affirming the consequent” is simply the term that we use to describe this logical structure. In other words, by demonstrating that this logical structure is invalid, I have shown that an argument that contains this structure (i.e., that contains an affirming the consequent fallacy) is invalid. This is why it is so important to understand logical fallacies and take them seriously when they are pointed out to you: they result in arguments with invalid logical structures. In other words, they create arguments in which the truth of the premises does not guarantee the truth of the conclusion. To further illustrate this, let’s move on from affirming the consequent fallacies and talk about a different fallacy: post hoc ergo propter hoc (or just “post hoc” for short). This is one of the most common fallacies that I encounter in debates about scientific topics, and it takes the following logical structure. The problem with that should be pretty obvious: the fact that one thing happened before another doesn’t mean that one caused the other. In other words, the conclusion does not follow necessarily from the premise. We can easily illustrate this with simple examples. Do you see how that works (or, rather, doesn’t work)? The fact that one thing happened before another does not lead to the conclusion that there is a causal relationship. The logical structure is invalid, and any arguments containing this structure (i.e. containing a post hoc fallacy) must be rejected. On a side note, this is a fundamental reason why anecdotes are worthless as evidence of causation. The fact the you got better after taking something doesn’t mean that it worked, and the fact that you had an adverse event after taking something doesn’t mean that the treatment caused the event. Both of those arguments contain this structure (i.e., they are post hoc fallacies), and, as such, they are not valid, and the conclusion does not follow necessarily from the premise. There are lots of other examples of this overarching type of fallacy, such as denying the antecedent, correlation fallacies, guilt by association, arguments from ignorance, etc., but they all have the same problem. Namely, they are invalid because they set up a logical structure in which the conclusion does not follow necessarily from the premises. Another major “group” of fallacies work by either implicitly or explicitly making an untrue premise. The problem here should be obvious: if an argument relies on an untrue claim, then the argument must be rejected (i.e., it is not sound). As before, an easy way to test for this problem is to see if you can find any examples in which the argument doesn’t work. Note: these groupings of fallacies are not officially recognized. They are just groupings that I personally find to be useful when thinking about fallacies and how/why they work (or don’t work, as the case may be). Let me explain what I mean by using one of the most common variants of these fallacies: the appeal to nature fallacy. This fallacy occurs whenever someone asserts that something is good/useful/healthy because it is natural or that something is bad/useless/unhealthy because it is unnatural. When can set this argument up the following way. Now, you could stop right there, and call this another variant of the non-sequitur fallacy, and you wouldn’t be wrong. This structure, as I have presented it, clearly is invalid because the conclusion does not follow from the premise. However, I think that there is a more useful way to think about this fallacy and others like it. Namely, this fallacy has an assumed premise that is false. It assumes that everything natural is good. Thus, there is really an implicit second premise. That second premise is, however, clearly false, and as a result, the argument fails (i.e., it’s not sound). Importantly, that premise (or some variant thereof, including the inverse “everything unnatural is bad”) is present in all appeal to nature fallacies. Thus, anytime that this fallacy is present, the argument must be rejected, because it inherently assumes an untrue premise. 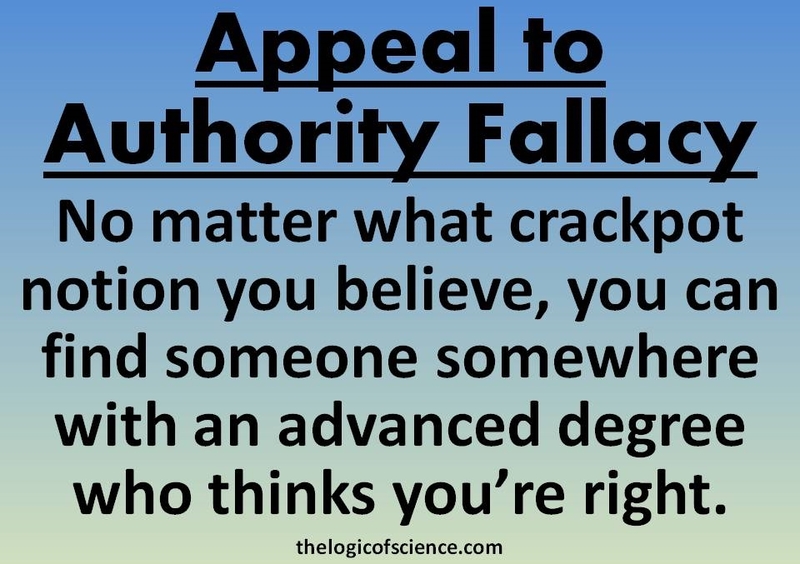 There are many other, “appeal to” fallacies, and they all have the same basic structure and problem. For example, appeal to authority fallacies occur when you say that something is true because of the person who says that it is true. When you do that, however, you are inherently invoking the premise that the person in question is infallible, which is clearly false. Other examples include appeals to popularity (which assume that everything popular is good/right), appeals to antiquity (which assume that anything old is good/right), appeals to tradition (which assume that anything traditional is good/right), etc. (note: the one exception to this structure is the appeal to emotion fallacy, which simply makes an argument based on emotions, rather than facts or logic). Note: You could also apply my “implicit untrue premise” explanation to some of the non-sequitur fallacies that I described earlier. For example, you could say that post hoc ergo propter hoc fallacies include the assumed premise that if Q happens before U, then Q caused U. There is nothing wrong with that way of conceptualizing those fallacies, and you are welcome to use it, I just personally find that explanation to be more complicated when the premise isn’t as simple as “everything natural is good.” You can, however, think of these fallacies either way. You can think of them as having an implicit and untrue premise or as having an invalid structure. I don’t care which you use, just so that you understand the concepts. Another common fallacy is much less subtle and directly states untrue premises. I am, of course, referring to the straw man fallacy. This occurs whenever you attack a weakened or misrepresented version of your opponent’s argument, then claim to have defeated their actual view. In other words, you say, “My opponent believes X, and X is wrong for reasons Y” when, in reality, X is a distortion or misrepresentation of what your opponent believes. Thus, your first premise is false (there are also subsets of this fallacy such as reductio ad absurdum). Fallacies of the false dilemma are yet another example of fallacies that operate via untrue premises. These take the form of “Either X or Y is true, X is false, therefore Y is true.” This sounds great, until you realize that premise one is false, and there was actually a third option (Z) that wasn’t stated. Finally, I want to briefly talk about some tools for detecting whether a logical fallacy has been committed. Obviously, your best bet is to study the different types of fallacies and learn how each of them works. I have compiled a list of common fallacies to help with that, as have many other sites (e.g. Internet Encyclopedia of Philosophy [this is probably the most comprehensive one], Skeptical Raptor, Your Logical Fallacy Is, and many others) . Let’s assume, however, that you don’t have time for that, you can’t be bothered, or maybe you have studied them, but still struggle with particular arguments (don’t worry, that happens to all of us). Fortunately, there are some simple things that you can do. First, I strongly recommend that you practice breaking an argument down into a syllogism like I have done throughout this post (start with the actual facts in the argument). Often, when you do that the problems will jump right out at you. If nothing immediately jumps out at you however, then try replacing the facts with letters (again, like I have done throughout). Then, look carefully at that structure and see if it is valid. See if the conclusion has to follow from those premises, and see if there are any implicit premises that need to be added. If, at that point, it is clear that either the conclusion does not follow necessarily from the premises or that there is an implicit and untrue premise, then you are done. The argument is flawed and you should reject it. If neither of those are obvious, then move onto the next tool. The second tool is simply to try to find examples where the logical structure of the argument fails. Use the syllogism that you constructed before, but this time, make actual premises that are true but unrelated to the topic of debate (like I did by using a sacrifice to show that post hoc fallacies were invalid). If you can find any examples (hypothetical or actual) where the premises are true, but the conclusion is clearly false, then you have just demonstrated that the logical structure is invalid (assuming that you were careful and did not alter the structure, otherwise you’ve committed a straw man fallacy). This is a very useful tactic that you should get in the habit of using (I explained it in more detail here). Although those two tools are useful, unfortunately, they aren’t all-encompassing. There are many other types of fallacies that I have not covered here because they are more specialized and difficult to generalize. Many of these are actually errors in debate tactics more than errors in reasoning. For example, a red herring fallacy occurs when, in a debate, you ignore your opponent’s argument/question and go off on an irrelevant side tangent in order to dodge a problem that they pointed out (politicians are masters of this). This type of fallacy is much harder to detect via a simple key like what I have presented, because there is no way to really construct a syllogism. It’s not a proper argument. Rather, it is a means of avoiding an argument. Similarly, for both straw man fallacies and false dilemma fallacies, you need to have enough knowledge on the topic at hand to tell that a false premise has been presented. That is the only way to detect them. So, although the tools that I have presented are useful and work in many situations, there really is no substitute for actually studying fallacies and becoming familiar with them. Obviously, this post has been far from exhaustive, and there are many other fallacies (and even types of fallacies) that I didn’t address. However, this should give you a basic understanding of why fallacies are a problem, as well as some tools for detecting them. Anytime that a fallacy is present, the argument must be rejected, because you cannot be confident that the conclusion is actually supported by that argument. Thus, you should be mindful of logical fallacies and strive to avoid them in your arguments and views. Further, if someone points out that you have committed a fallacy, take that accusation seriously and look closely at their claim to see if it is correct. No one is immune to these flaws in reasoning, but there is no excuse for ignoring them once they have been pointed out to you. Note: It is worth emphasizing that when an argument contains a logical fallacy you must reject the argument not the conclusion (rejecting the conclusion rather than the argument is actually a fallacy known as the fallacy fallacy [that’s not a typo]). It is entirely possible to have an invalid argument, but a true conclusion. In other words, your conclusion may be true, but you cannot use that particular argument to support it, and it must be supported by other lines of evidence/reasoning. This entry was posted in Rules of Logic and tagged ad hominem fallacies, appeal to antiquity fallacies, appeal to authority fallacies, appeal to emotion fallacies, appeal to nature fallacies, argument from ignorance fallacies, Bad arguments, evaluating evidence, logical fallacies, post hoc ergo propter hoc fallacies, rules of logic. Bookmark the permalink. By definition there is no such thing as a “Logical Fallacy”. By their very nature, a fallacy is not logical and logic is not fallacious. Logic is about precision and attention to detail so “figures of speech” whilst entertaining should be used very carefully when discussing logic. 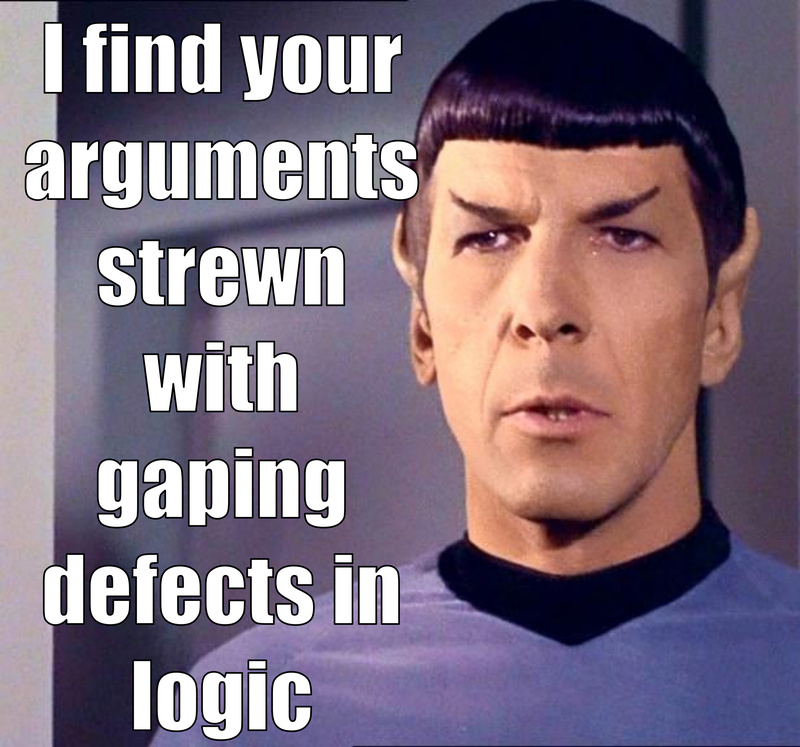 An argument can be “illogical” or involving a fallacy. It can be “invalid” or contain an error. It cannot be a “Logical fallacy”. I suggest “Fallogical” – an argument that falls short of logical rigour because it contains a fallacy. You seem to be playing semantic games and creating your own definitions for widely accepted terms. Interesting. Those of us who practise and promote logical thinking are often accused of being over pedantic when we question “widely accepted” notions and point out errors, misconceptions and fallacies. However, as you say, logic is very important in the search for truth and understanding. But we should not consider ourselves to be above criticism for failing to practise what we preach. Logic can be a game but it is so much more than that. Semantics can be a game but semantic rigour is fundamental to any logical analysis. The mantra “define your terms” is very good advice and an essential prerequisite. We should be humble here and accept the criticism that “Logical Fallacy” is an oxymoron and seek to agree on a better term. My “Fallogic” was no more than a suggestion and we should look to correcting ourselves as well as those who practise it. 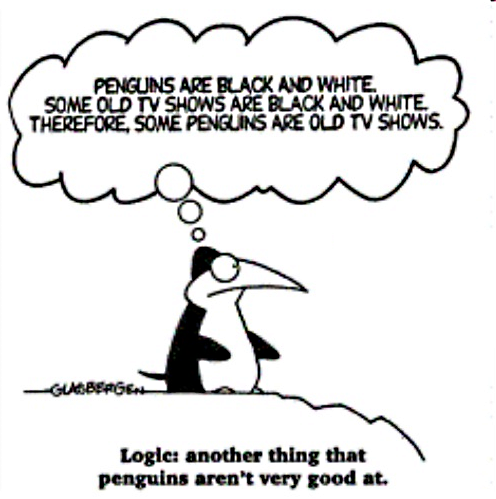 “Logical fallacy” seems no worse to me than “erroneous prediction” or “arithmetical error”. Nor is there any risk of anyone drawing erroneous conclusions from the term. The tension between the two words has the desired connotations, and I see no reason to abandon the well understood expression. Ask Alex Salmond about how his 2014 prediction of Scotland’s oil revenue turned out to be erroneous. So there is no inherent contradiction between those two words because predictions are inherently speculative. You talk of the connotations of the tension between two contradictory terms. That introduces a level of subjective assessment. My point is that we don’t allow subjectivity or “colour” when criticising illogical statements and fallogic. So, to be logically consistent, we should tidy up our terminology and adopt a more objective notation. In logic, we are not telling a nice story, we are seeking valid, rigorous and objective statements. If we insist that the those who use illogical arguments should clean up their act then they are right to point out that, logically, so should we. The concept is important, the term that you use to describe it is irrelevant. In other words, concepts have to be precisely defined and explained, but the terms that you assign to those concepts are totally irrelevant and change nothing. You could call logical fallacies “flugaldorphs” for all I care, it wouldn’t change their definition or usage in any way. Having said that, changing the names of terms after the name has become widely accepted almost always results in more confusion, not less (especially in this case since no one is confused by the meaning of the term “logical fallacy”). Indeed, going around saying things like, “there is no such thing as a ‘logical fallacy'” is confusing, because the term “logical fallacy” is well defined and has meaning. For someone who is arguing for the importance of precision, that was a pretty sloppy statement. I’m assuming you meant, “the term ‘logical fallacy’ does not make sense because something cannot be both logical and a fallacy'” but simply saying that logical fallacies don’t exist is extremely misleading because they clearly do exist, even if you don’t like the term. My point is that debates like this tend to make things more confusing for people, not less. Ultimately, I think semantic debates like this are entirely pointless, so I won’t bother beyond this post. You are welcome to call fallacies whatever you want. So long as we agree about how they work and why they are a problem, I truly don’t care what you call them. I have seen that kind of reaction from people who use illogical arguments that are then challenged. I call it the “Well you know what I mean” syndrome because they often do not say what they mean or mean what they say . Concepts can of course be assigned new words like “flugaldorphs” that don’t carry any baggage inherited from other meanings. That’s very different from terms made out of well established words with prior meanings. Many people think that the so-called “Black Boxes” are black but they are not. They are orange. There was a time when “Flat Earth” was considered to be an accurate description. So why don’t we still use it as such if it’s OK to use confusing terms? I’m playing the Devil’s Advocate here. We criticise people for their use of illogical arguments and many of them find that irritating. They have a case because not everyone want’s to be Mr Spock. You clearly find this irritating and I can see why that is. However, I am unrepentant because logical consistency should be your objective and what is sauce for the goose should be sauce for the gander. The Golden Rule – do as you would be done by and eliminate illogic from your own use of language. I’ve often thought that the term “logical fallacy” is a strange term; were I travelling back in time with the power to change the “widely accepted” definition, my preferred term would “illogicals.” However, as a Composition Instructor for over ten years, I can confirm that “logical fallacy” is the accepted terminology used throughout Composition and Rhetoric-based higher education courses. Currently, I use ESSENTIALS OF ARGUMENT, 3rd ed. by Nancy Wood, published by Pearson in my Composition II courses. Chapter 11 deals with logical fallacies in detail and specifically uses the term “logical fallacies” in making its point about detecting flaws in arguments. The two textbooks I used previously, one published by Norton and the other by McGraw-Hill, both had chapters on logical fallacies, and consistently used that term, as well. This is a strange place to have to point out that long term universal acceptance is not a necessary and sufficient condition for veracity. For many centuries, the term “Geocentric” was believed to be an accurate description of the Universe. That didn’t make it so. The “force” of gravity does not exist and entropy is NOT a “measure” of disorder. I am well aware that “Logical Fallacy” is widely accepted and deeply embedded in our culture but that does not make it logical. If we are to be consistent in proclaiming the merits of logical thinking then we should work to put our own house in order. The term “illogic” is so much better than the oxymoron “Logical Fallacy” which signals a level of sloppiness in the self application of the logical rigour being advocated. In logic, we should mean what we say and say what we mean and we should never mean that such a thing as a “logical fallacy” can ever exist. Rhetoric has it’s place but illogic can and does hide away under the “Well you know what I mean” banner. Logic is a matter of discipline and analytical rigour and these priorities must take precedence over rhetoric, custom and practice and verbal nudges. I know that I said I wasn’t going to comment any more, but I can’t help but briefly point out that your geocentrism example is fundamentally flawed, because the concept of geocentrism is wrong. We didn’t replace the term, we replaced the concept. Indeed, we still use the term “geocentrism” when talking about the outdated model. To put that another way, we didn’t replace the term “geocentrism” with the term “helicoentrism.” Rather, we replaced the concept of geocentrism with the concept of heliocentrism. Replacing a false concept is very different from replacing the term for a correct concept. Concepts matter, but the terms that we use to describe those concepts are arbitrary. This is turning out to be an excellent illustration of what the issue is here. There are three, quite distinct aspects to this. Firstly there is the reality of the point being considered. Secondly there is the scientific model of that reality and thirdly there is the term commonly used for reference. People unfamiliar with the science will tend to derive information from the descriptive term and if this is constructed from familiar words that have a range of normal meanings then the derived meaning can be misleading. Here’s another example. A “Shock Absorber” is NOT a device fitted to cars to absorb shocks. The springs do that job. The so-called “Shock Absorber” is, in reality, a suspension damper that presents a rock-solid resistance to an impulsive shock. For many centuries, these three aspects in the context of the form of the universe were considered to be consistently represented by the term “Geocentric”. That term strongly suggested the scientific model as it was at that time. As science advanced, the model was replaced and we decoupled our model of the universe from “Geocentric”. My point there was that we can and do change the terms we use and the context in which we use them when we realise that they are in inappropriate. Clearly, by your own admission, “Geocentric” is NOT an arbitrary term because it makes sense to retain it in connection with the outdated model that the words from which it is constructed suggest. We do NOT now use it to relate to the concept of a model of the Universe because that would be misleading. The term “Logical Fallacy” is also NOT an arbitrary term because, as with “Shock Absorber”, there is a temptation to derive information about what is being referred to from those words that have prior meanings and connotations. Terms are also “advertisements” for the discipline to which they relate. So, right up front, “Logical Fallacy” characterises logical thought as being rather sloppy and it is anything but that. It is the ultimate rigorous and disciplined enterprise and it should advertise itself as such. Thanks, Lori. I always enjoy hearing that professional educators find my posts useful. If “logical” only meant “reasoning or capable of reasoning in a clear and consistent manner”, then “logical fallacy” would indeed by an oxymoron. But since “logical” also means “of, relating to, in accordance with, or of the nature of logic,” a logical fallacy is perfectly possible: it is “a false notion” “relating to … the nature of logic”. By it’s very nature, the promotion of logical modes of thought and expression is an exercise in extreme, or even absolute, pedantry. Logic stands in contrast to anecdotal, colourful or romantic forms of expression because it is intended to result in objectively correct rather than subjectively pleasing conclusions. The logician should practice what he preaches. As for your “false notion” relating to the nature of logic” I see a number of problems with that. In the expression “Logical fallacy” the term “logical” is an adjective and “fallacy” is the noun that it describes. It is rather obvious that a fallacy does not “relate to the nature of logic” because a fallacy is characterised by a violation of the demands of rigorous logic. The statement “Today isn’t Monday or Friday therefore it must be Sunday” is an obvious fallacy. It has the attribute of not being logical . We say, correctly, that it is not a logical statement. How can a fallacy that, by definition, is not logical also be a logical fallacy? In brief, we would not accept the first premise unless we were already, independently, prepared to accept th econclusion, on the basis of multiple observations and assumed similarities. Even if we rejected the first premise (believing, say, that Eliah never died but ascended alive to heaven), we would still have noserious doubts about Socrates’ mortality. Thus the conclusion is, from the outset, better substantiated than the general premise invoked to prove it. The argument is logically valied but heuristically useless, and I suspect this may be a very common feature of “all”-based syllogisms. That is a good point that I have argued elsewhere as well (at least I think I actually uploaded that post, sometimes I write posts then never get them quite to a point where I am happy enough with them to upload). The first premise is essentially based on inductive logic and cannot actually be proved.